Thank you so much for your support, comments, and emails this year! 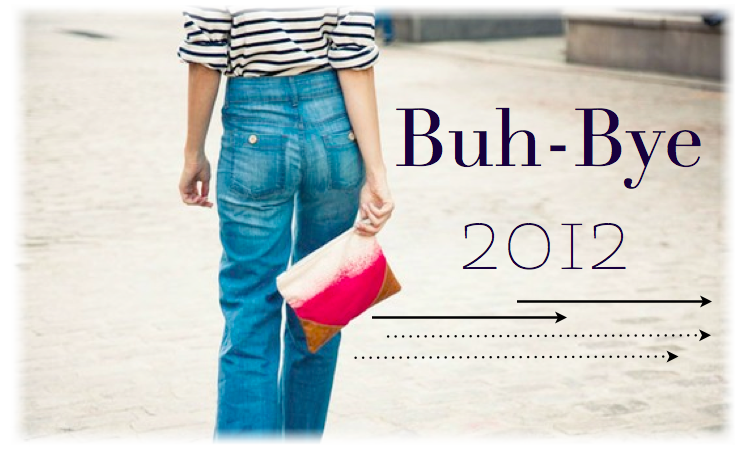 Looking forward to 2013! The frenzied pace of the holiday season leaves me craving a little simplicity and organization. Above, a few perfectly organized spaces that serve to renew my commitment to purge and organize this new year. Safe travels to all headed to spend the holiday with family and friends. 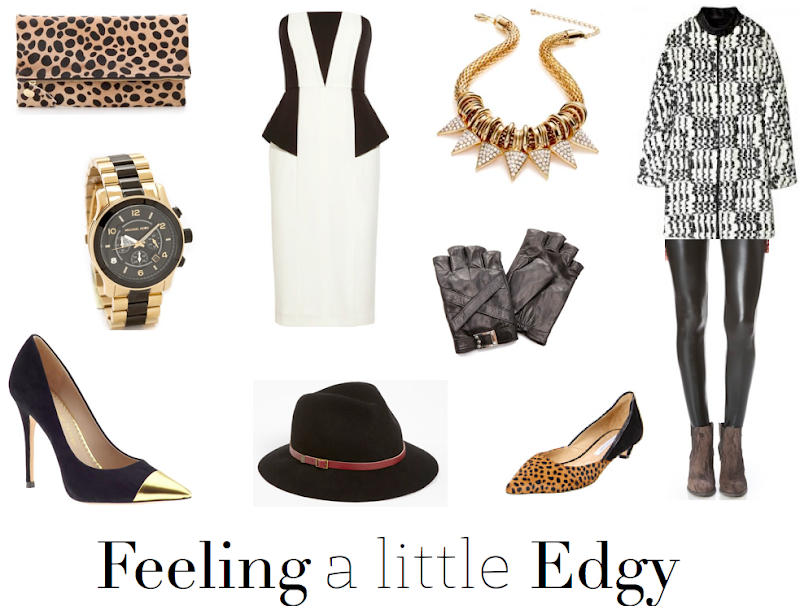 At times, I really enjoy dressing with more of an edge... like the juxtaposition of a huge watch on my petite wrist. Scroll through my selections below using the arrows, hover over images for pricing, and click the picture to link straight to the product. As of late I've started making efforts to purge and simplify my wardrobe and home decor. At home I'm changing things back to a softer, cleaner color palette... a new jute rug, crisp clean white slipcovers to replace my currently worn/loved ones. 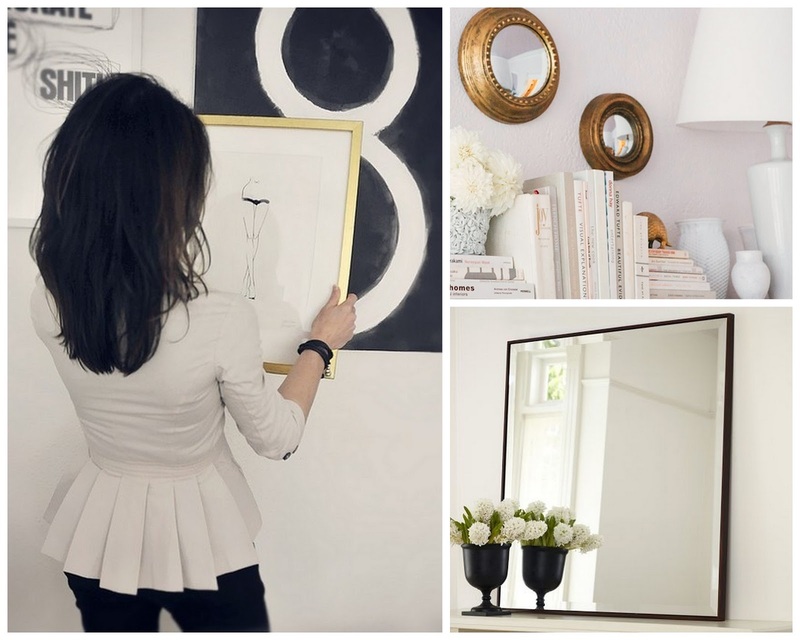 I'm also on the hunt for vintage finds- high on the list is a large mirror. I'm toying with the idea of setting up and Etsy shop with some of the items I'm ready to part with. Would any of you be interested in that? Do you have your own shop? How has your experience been? Please look forward to an email from me today! Thank you all so much for your support and entries! I really enjoyed hosting this giveaway. 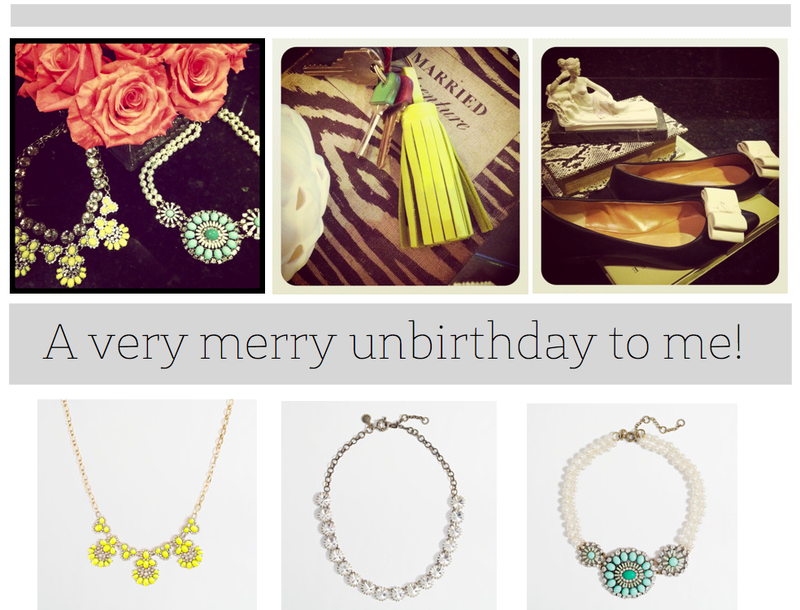 Today's my birthday so it's fun to do something like this to celebrate on the blog. Scroll through the dresses and click on any that peak your interest. I was a sneeze away from buying this dress last week and think I may just have to cave! Want to look couture without the monetary commitment? 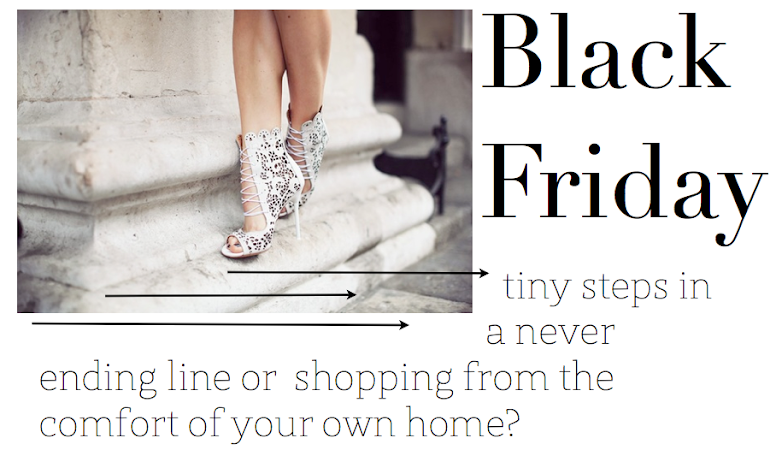 Then Rent The Runway honey! Love, wear, then return your most coveted designer looks. 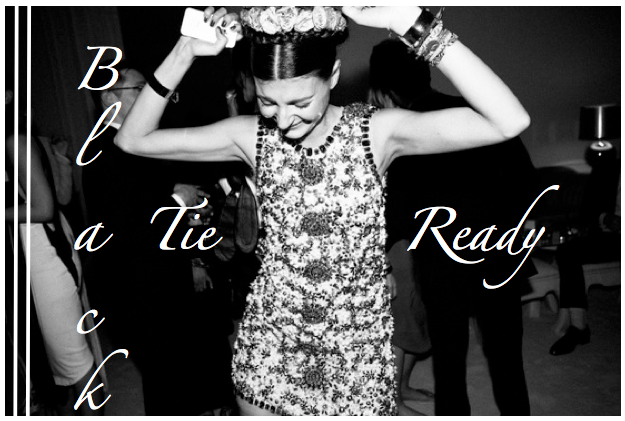 Rent The Runway allows you to rent a dress or accessory for ten percent of the retail price! They carry over 140 designers and will ship a dress to you in two sizes to ensure the perfect fit. Pre-stamped return envelopes allow you to ship the dress back easily, and they take care of the dry cleaning. What are you plans this holiday season! Any exciting events? Louis Vuitton iPhone Case Giveaway! That's right folks! I'm in the holiday spirit and hosting my first ever giveaway! While shopping with my little sister she (not so tactfully) pointed out that I was carrying my vintage LV bag, a wallet, and an iPhone case. OK, OK, I know... I took it too far. My mistake is your lucky little holiday gain. I'm paying it forward on this one and hosting a giveaway for my authentic LV 3G iPhone case. I keep my iPhone 4 in it and it fits perfectly. The winner will receive the original box, dust bag, and the case itself which is in pristine condition. REMEMBER YOU MUST LEAVE A COMMENT IN THIS POST TO BE ENTERED! 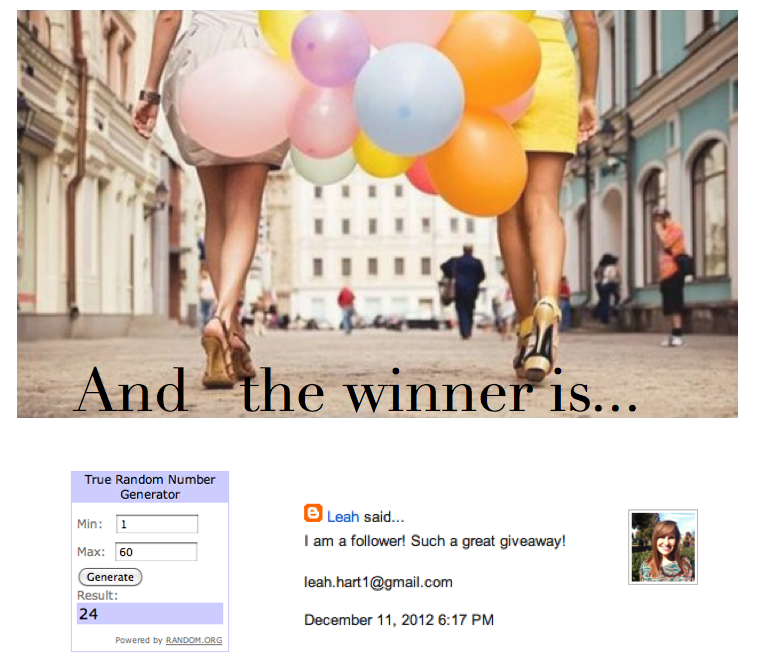 Be sure to leave a separate comment for each entry as it will heighten your chances of winning. Please note this giveaway is in no way sponsored by Louis Vuitton and is only open to readers inside the Continental U.S.
Good luck! I hope you love this little guy as much as I have! 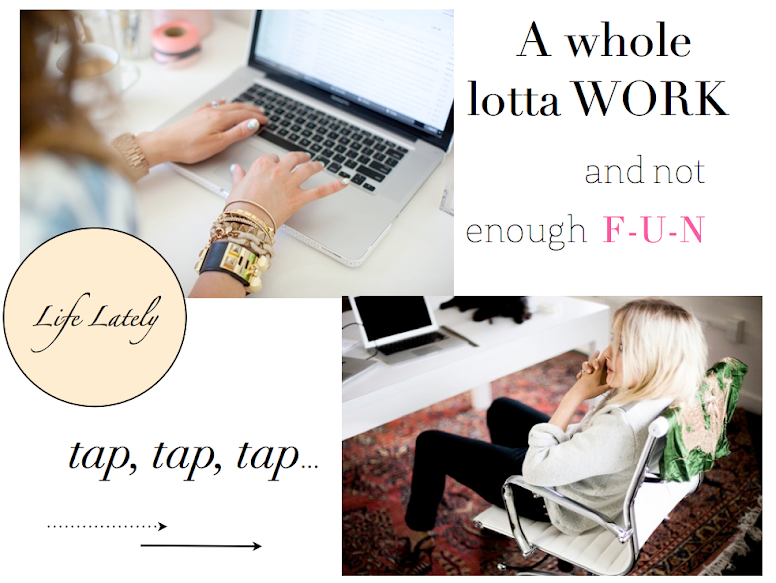 Today is a very important day for me at work; so, I thought I would feature some fun items that can add a little sparkle to your own workday routines. 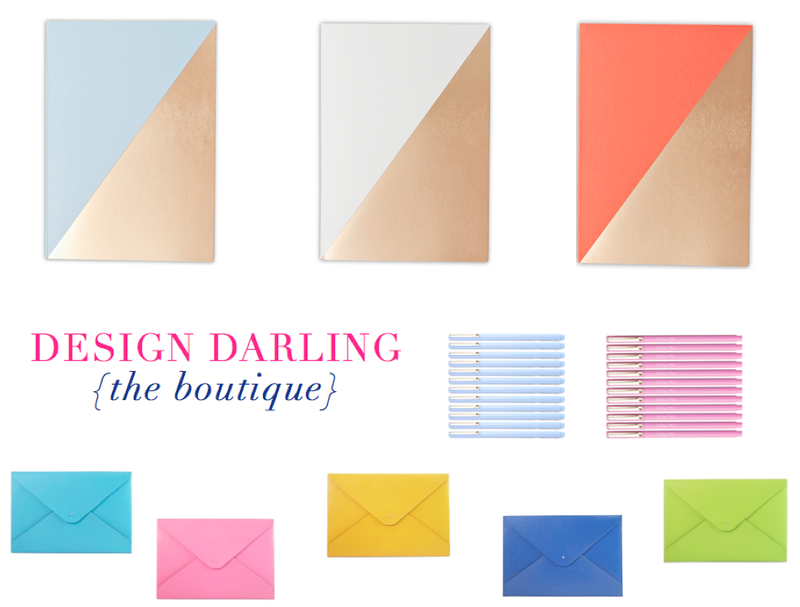 Mackenzie's online boutique, Design Darling, is full of treasures but today I'm featuring her gold foil notebooks, business card cases, and colored Le Pen's. I would happily take notes and compile to-do lists in these stunning notebooks. They contain 56 unlined pages and measure 5"x7"
Who doesn't want a business card case that reflects a bit of their own personal style? These eco-friendly cases are made from recycled leather and fit standard size cards. I can't decide between lime green, pink, or cobalt blue? Any work accessories you can't live without? Share in the comments section below. What are your thoughts on bows this season? I'm smitten. 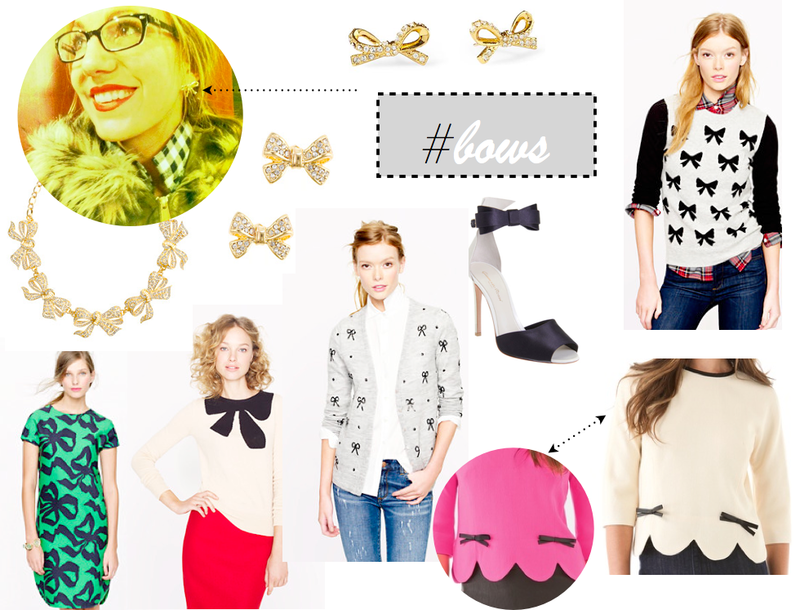 My friend Olivia from O.Style scored the amazing vintage bow earrings pictured above. I swear she was about six months ahead of the curve on this one. Now everywhere I look... bows, bows, bows! No complaints on this one-as long as you're not wearing them on headbands in your hair- that's reserved for little girls 10 and under in my book. (not that there's anything wrong with that- I have a sick vintage tartan shirt and long pencil skirt I totally plan on rocking this winter). 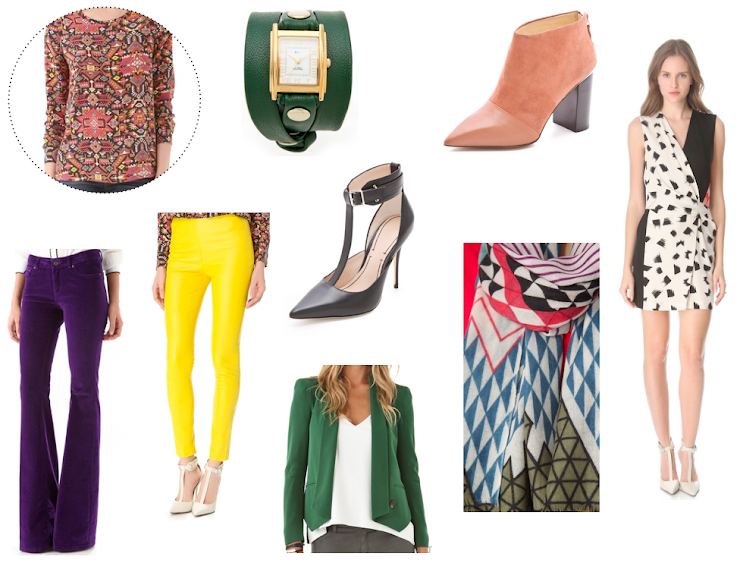 Do you feel pressure to stick to reds, greens, tartan and velvet during the Holiday season? Would you wear something like this to a winter event, cocktail party, night out with girls, or a dinner with friends? Or, does this read a little too Miami summer soiree to you? What are your thoughts? Weigh-in, I'd love to know. 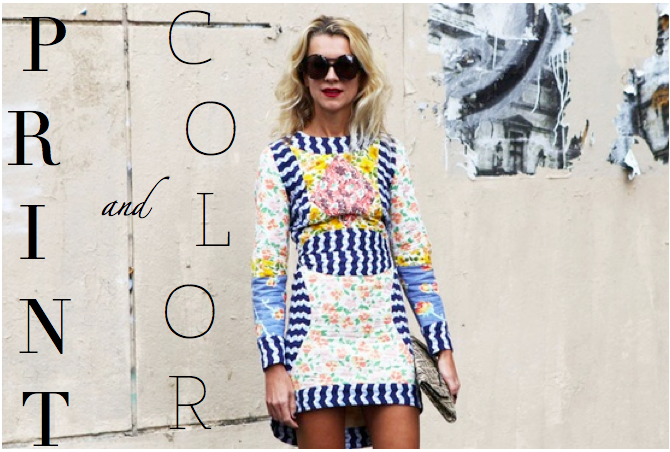 Shop additional colorful looks below and find the above dresses by clicking the arrow tabs to scroll. Hope you have a happy and healthy day! I just cant get over the perfect marriage of masculinity and femininity in this space. Each with their own independent perspective/voice present; yet neither over powering one another, nor competing. The design works in harmony portraying strength, warmth and grace. Kind of sounds like the perfect relationship to me. Lot's of hard work and coffe helped me get through last week. I submitted a 64+ page project and now just need to get my formal presentation ready. Hoping to restore some balance this week including more posts here and a few visits to the gym! I've updated my posh purchases section on pinterest if you want to check out a few of my recent lustworthy items. 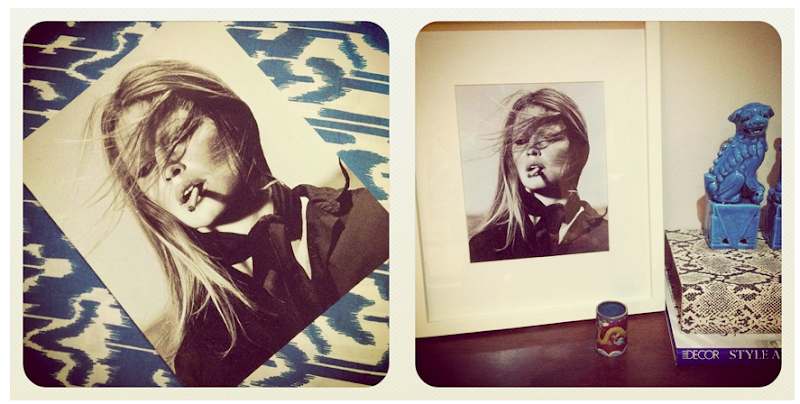 Above: My Bridget Bardot print arrived and I couldnt be happier. I immediately framed it and love! Update: For those of you asking I purchased it here on ebay total was under ten dollars with shipping! Really missing my normal posting schedule right now. Just finishing up a big project and am hoping to get back to regular posts at the end of the week. I don't know about you but I always choose the latter on Black Friday. I'm not one for crowds, and the day after Thanksgiving means pumpkin pie for breakfast, copious amounts of coffee, and a possible trip to the movie theatre. OK fine I'll admit it, a definite trip to the movie theater to see breaking dawn... teenybopper! I do, however, check out the cyber deals and have a few I'm definitely hitting up. Thought I'd pay it forward and give you the codes I've rounded up thus far. 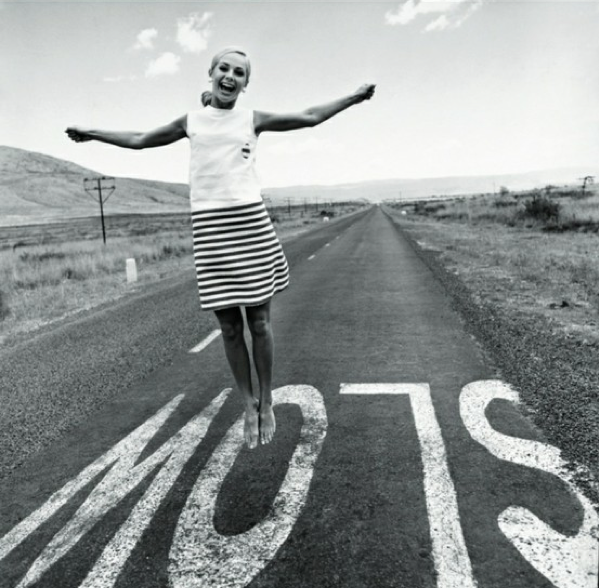 If you follow me on twitter or facebook you've definitely seen a few of the sale items I'm currently coveting. 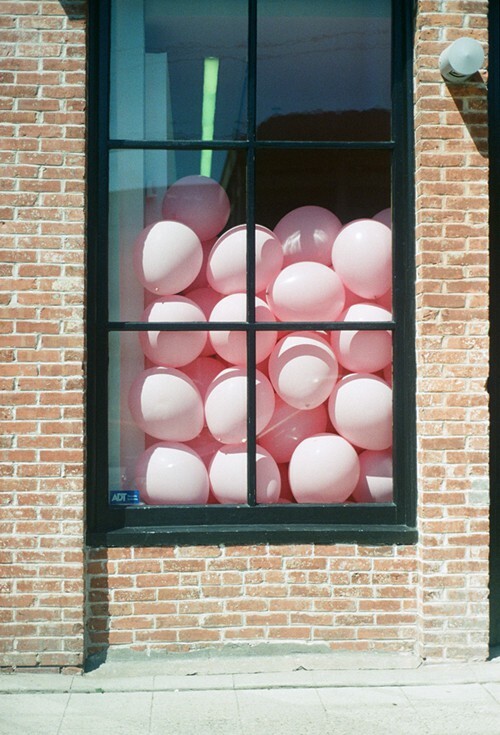 Madewell: get 25% off everything and free shipping! I'm seriously dying over this coat and this statement necklace! GAP: 60% off the entire store! Also finding lots of great deals over on Gilt I would definitely head over and check it out! Is there anything I missed? Leave a comment or tweet me so I can update on all the cyber savings! I've put together some of my favorite offerings. I tried to choose items that are versatile. What... yellow leather pants ARE versatile in my world. Pair them with sky-high heels, a black silk top, & a leather jacket for a night out. Want to keep it a little more casual? Rock a faded broken-in tee, pumps, and no jewelry. For day I would wear flats and a chunky knit sweater. The rest of my selections are a bit easier to integrate into an existing wardrobe. Shop the looks below. To see all of my current lust worthy picks head over here. I haven't been home since the summer so I'm beyond thrilled to be hopping a flight at the end of the day to see my family! I just need to kick this terrible cold, get through a jam-packed morning/afternoon, pack up all my work (ugh, yes a working holiday) and hitch a ride to the aeropuerto! Wishing you a happy and healthy Thanksgiving. 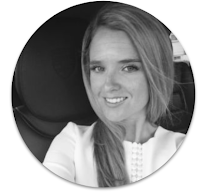 I'm so grateful for your support here on this little blog. All of your comments, emails, and feedback mean more to me than you will ever know! Some things deserve a post of their own. Such is the case with the violet continental zip wallet by Tory Burch. I love the color palette, and the full zip closure. My vintage Gucci wallet has seen better days so I've had my eye out for something special- this certainly fits the bill. I like having a big wallet for daytime and then I always switch to something smaller and more practical for evenings out. What do you think? 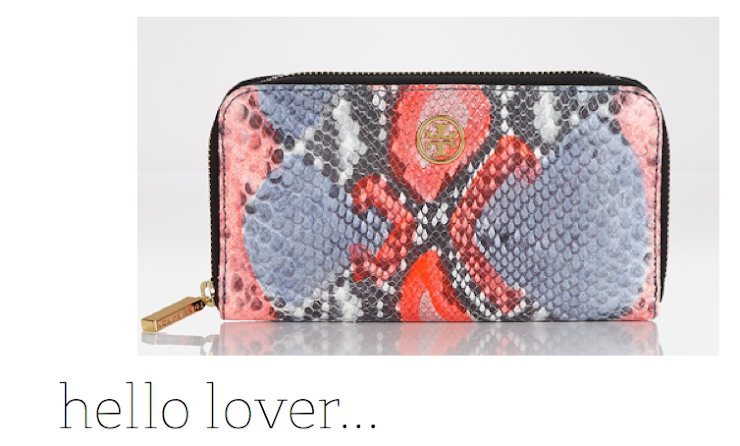 Would you rock a statement wallet like this one or do you like to keep it simple? So ready to fly into the weekend! Wish I had something like the above piece to throw on- it's literally a piece of art. 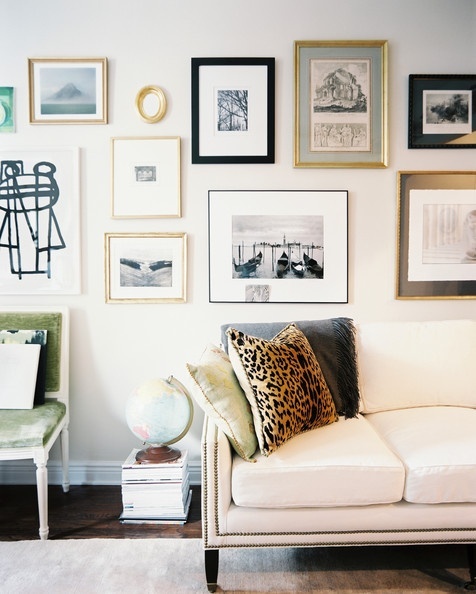 Above: the space is organizational bliss; but, the black and white portrait is striking! It reeks of an alluring irreverence. That chick is B-A-D... in the best possible way. (Is that a photograph of someone I should know about? It's getting a little chilly these days- which I love (true New Englander at heart). I'm always wearing hats and think I may try to snag a neon beanie a la Elin Kling. Could she be more chic? 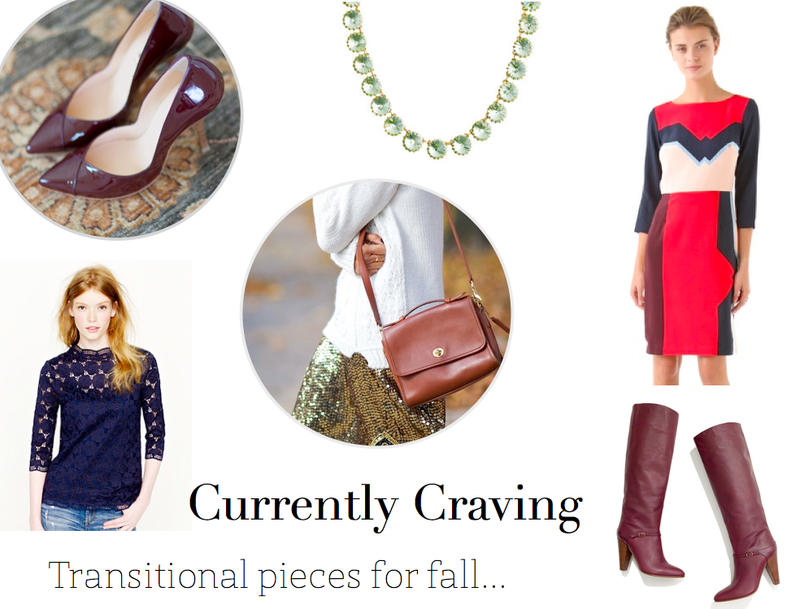 Anything you're looking to incorporate into your winter wardrobe? Would love to hear! 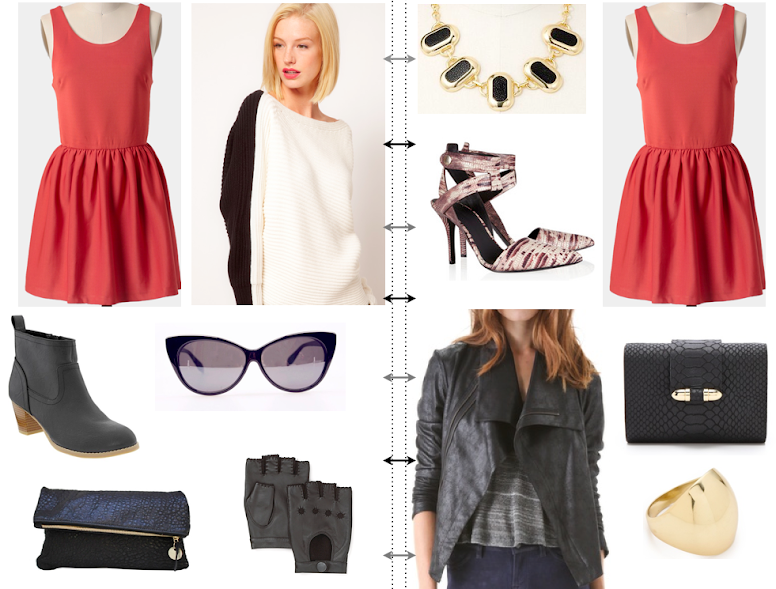 Loving how this simple color palette can be so versatile and wearable. This one dress can take you from day to night. Dress it down during the day by layering it with a sweater tights and chunky boots. At night dress it up with a jacket that has a sophisticated silhouette. Add some baubles, statement heels, a clutch and you're done. 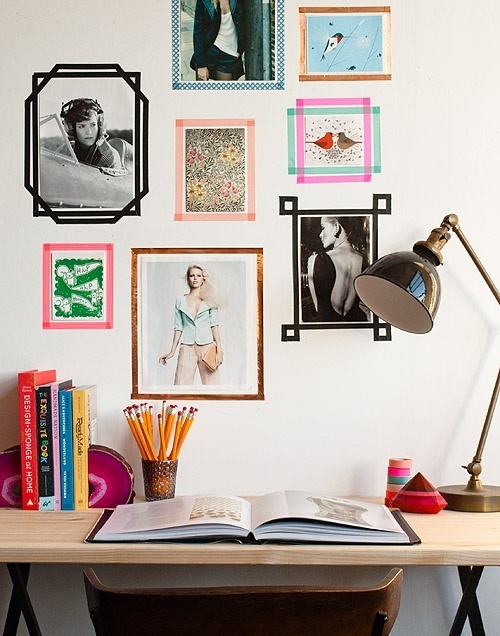 Love this DIY using washi tape as frames. Cheap and chic. 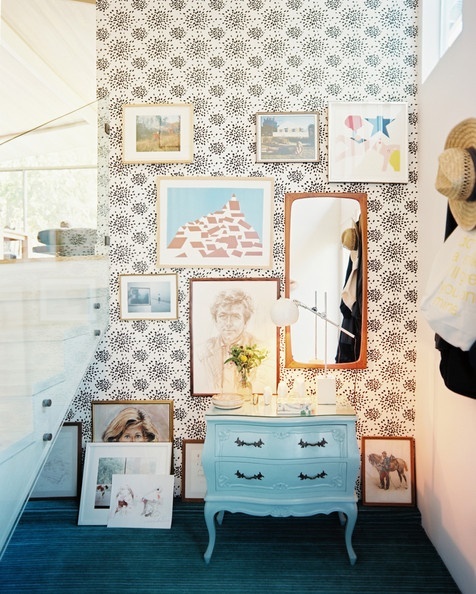 Also love this gallery wall set against Hinson's fireworks wallpaper. 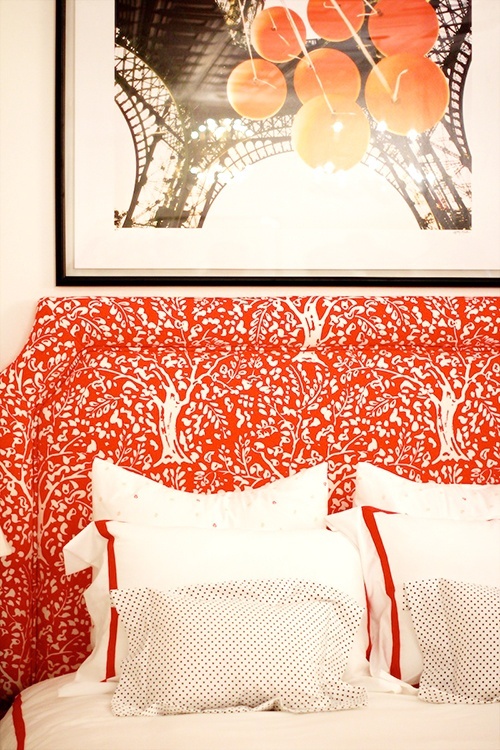 Love the bold red headboard paired with the playful polka dot shams. Ummmmm, what hapenned to fall? Didn't get the memo we were skipping it and heading straight into winter. Seriously? I heard lots of friends had their first snow today! LUCKYYYY. I'm rarely, if ever, cold. Accordingly, you won't find me donning a bulky sweater and boots at the first sign of fall weather. I generally hold-off on jackets all together and transition slowly into autumnal layers. My first efforts to acknowledge the changing weather materialize solely in the color palettes I choose to wear. Then I start thinking 3/4 length sleeves. Next, que little booties like these. Then the full-on, real deal, fall boots. Little oxblood heels- I love you with your pointed toe, stacked wood cigarette heel, and on-trend hue. I know you were hand crafted in Portugal just for little old me. Crystal venus flytrap necklace- Let's work together. I'll introduce you to new friends as I stack and layer-up multiple necklaces. I'll even let you stand alone on days when I feel like talking to strangers. Your unique celerary shade is sure to be a conversation starter. Navy lace mockneck tee- you've been waiting all summer, now is your time to shine. Hands free Coach willis bag- you're a throwback to the classic sophisticated silhouette of yesteryear. Stick with me- we'll go places. Madewell alcove boot- I'm digging the retro vibe. You feel a little 70's and I'm pickin' up what you're puttin' down. Plus you go perfectly with Lola... please talk some sense into her. No it's not my birthday but it sure feels like it! I posted on J.Crew Factory a while back and wanted to share a few of my recent purchases. Many of their products are close to exactly what's offered at J.Crew but at a much lower price. I picked up these little pants in navy and may have gone a little overboard on the necklaces- but I love the idea of layering them up (like I have displayed above). 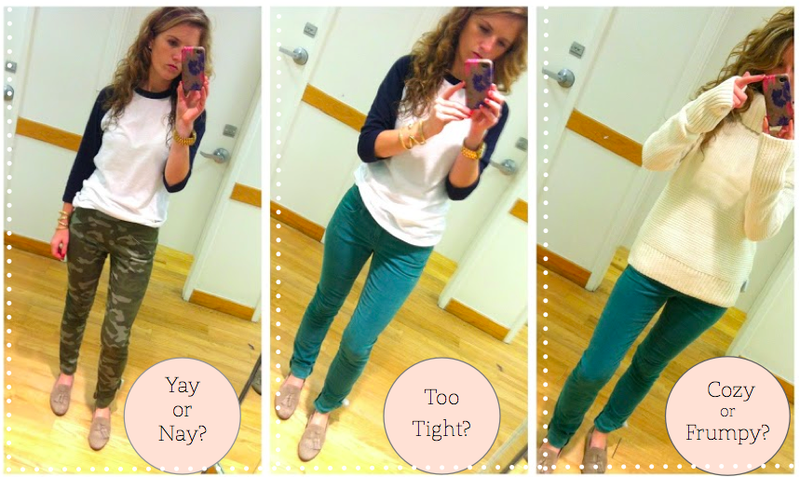 Have you checked out J.Crew Factory? 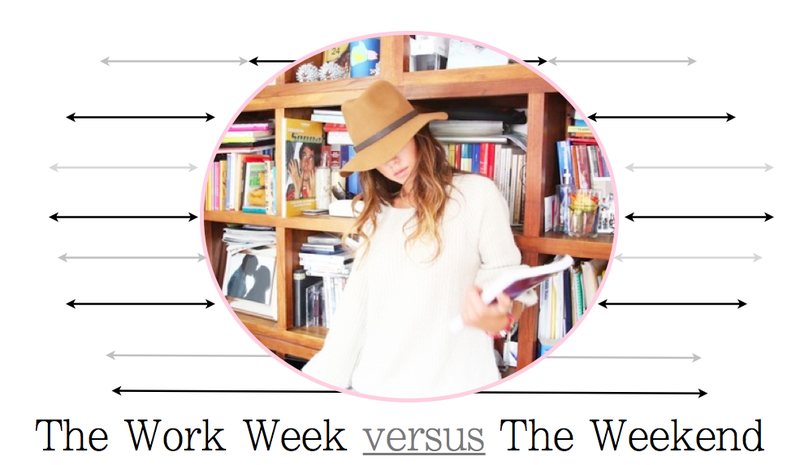 At certain times in the year it can be difficult for me to clearly delineate between the work week and the weekend. There "should" be an appropriate time to check-out, rest, and re-connect with friends and loved ones. However, work emails come straight to everyone's phone and there are pressures to stay "connected". I always notice when someone doesn't check that lingering buzz; even more so when someone actually allows a call to go to voicemail! Technology constantly has us betwixt and between personal and professional worlds. I'll be the first to admit that I'm guilty of hopping right on my phone at any hour of the day or night to answer an email just so I can check it off of my "to-do" list. I've also been guilty on too many occasions of saying to whomever I'm with: "I just have to get this one email off and then I can end my day and listen". I'm currently creeping towards the finish line of a year-long professional review so my weekends are now officially "work time". I'm too busy fulfilling regular work week expectations Monday through Friday so the push will be to complete everything else on the weekends. How do you stay balanced during times like this? I've scheduled time for runs, time for quick dates with friends, and I try to dress in a more laid back manner (Que image above); but, my highest priority is work! I am definitely fearful that time with friends or time with myself (exercise) will quickly take a backseat to creating a quality finished product for work. Am I alone on this one- or do we all lose sight of what's most important at times? Don't forget to take some time for y-o-u!